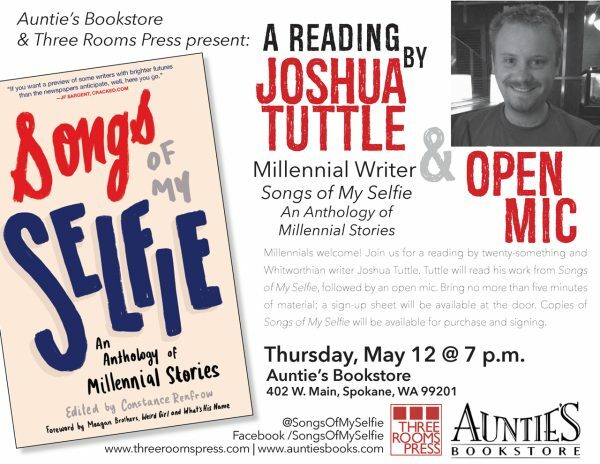 Notable millennial writer and Whitworthian Joshua Tuttle will discuss the challenges young writers face and read from SONGS OF MY SELFIE: An Anthology of Millennial Stories (Three Rooms Press) followed by an Open Mic on Thursday, April 18, 7 p.m. at Auntie’s Bookstore in Spokane. This event is free and open to the public. If you’d like to perform, bring no more than five minutes of material; a sign-up sheet will be available at the door. All generations welcome! The event begins at 7 p.m. Admission is free. Auntie’s Bookstore is at 402 W. Main, Spokane, WA 99201 (http://www.auntiesbooks.com/). Joshua Tuttle is a US Army Veteran, Eagle Scout, and Dungeon Master, and in a former life he was an IT engineer. He studies Computer Science and English at Whitworth University in Spokane, Washington. He has been published in Script, and an upcoming RPG supplement entitled “The Demonic Interference at New Ritipus Church” was recently published on DriveThruRPG by the end of the year. Schedules permitting, his Gothic Horror D&D game meets weekly on Sundays. In his remaining spare time, Josh runs the Spooky Scary Skeletons Literary and Horror Society, which meets twice monthly in Spokane, Washington. Public-facing meeting notes can be found at www.spookyscarysociety.com. Auntie’s Bookstore opened in 1978 in the Spokane Flour Mill under the name of “The Book and Game Company” and has been selling books ever since. Auntie’s moved to its current location in the Liberty Building in 1994 located on the corner of Washington and Main. The store carries both new and used books, cards, T-shirts, Spokane specialty items and other gifts to bring home for yourself or your favorite bibliophile. We are a full service independent bookstore! We offer bookstore credit for your gently used books, we hold events, signings, story time and so much more. Our booksellers love books and are looking forward to helping you find your next great read. If you’re looking for a book and we don’t have it in stock, we can get most orders in just a couple days. Three Rooms Press is a fierce New York-based independent publisher inspired by dada, punk and passion. Founded in 1993, it serves as a leading independent publisher of cut-the-edge creative, including fiction, memoir, poetry translations, drama and art. In addition, Three Rooms Press produces and promotes a variety of literary and cultural events in New York, London, Paris, Berlin, Brussels, Los Angeles, San Francisco, and more, including readings, plays, workshops, and concerts.